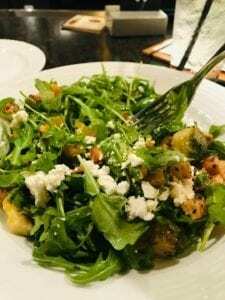 Foodie Friday features a nutritious salad with arugula, roasted yellow beets, brussel sprouts and goat cheese in a champagne vinaigrette. 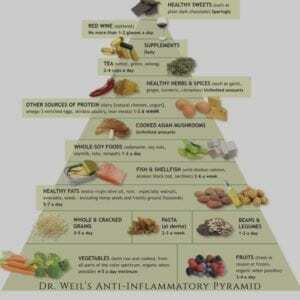 Eating healthy lowers your risk of developing chronic conditions like heart disease and diabetes. 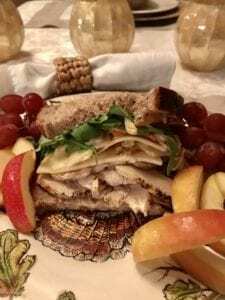 Foodie55 shared this Green Apple Turkey Salad at a recent potluck and received rave reviews. 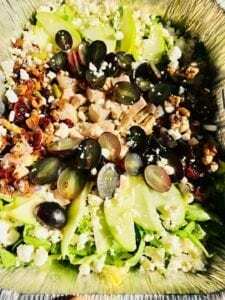 We used butter lettuce, spinach, thinly sliced tart green apples, halved grapes, toasted walnuts, turkey (leftover from Thanksgiving taken out of the freezer and cubed), dried cranberries & feta cheese with a light raspberry vinaigrette. 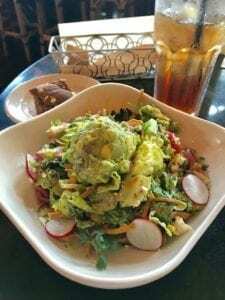 It was healthy, yummy and economical. No rules apply, so make your own variety! 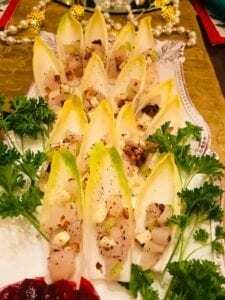 Foodie55 know holiday parties and healthy appetizers collide with endive cups filled with your choice of fillings. Our fav is finely chopped pears, brie and toasted walnuts. Take ’em to your next pot luck and listen to the kudos roll in. 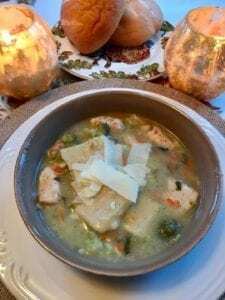 Old-fashioned Chicken & Dumplings take a 55+ ride when carrots, broccoli & spinach are added early in the cooking process. For this batch, we browned 3-chopped boneless chicken breasts, 1/2- cup chopped small yellow onion and 1/2-cup of chopped celery in a large stock pot. Then added chopped 2-cups of chopped broccoli, 1-cup shredded carrots, 2-cups of chopped spinach and 8-cups of chicken stock (low sodium) and brought it to a boil. While boiling, we slowly added 2-12 oz bags of Reames Homestyle Flat Dumplings. Once it began to re-boil, we stirred, then turned the heat down to medium-high and cooked for 1 hour until the dumplings were softened. For a thicker broth, add flour or cornstarch using a small separate bowl to place your thickner in, add a bit of pot liquid & mix, then add this mixture to the main pot. Serve with a crusty bread & Enjoy! 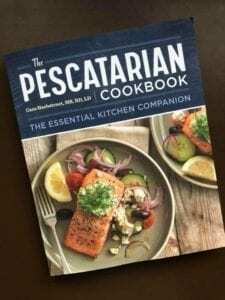 Cara Harbstreet, Registered Dietitian, author of The Pescatarian Cookbook – The Essential Kitchen Companion, CEO of Street Smart Nutrition and Libre Connections is our peer in entrepreneurial incubator, Betablox. 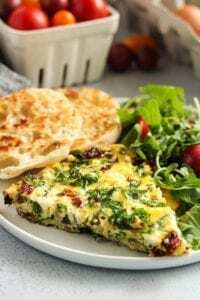 Cara knows that Boomers and Seniors need extra protein and she encourages us to “eat the yolks” especially in her yummy Sun-Dried Tomato and Kale Frittata dish. 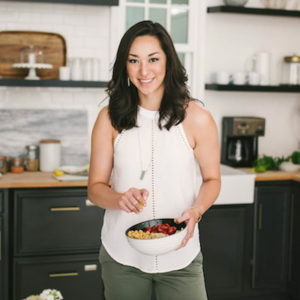 And check out her podcast, “You Can Eat With Us” featuring a plethera of wisdom on intuitive eating and body acceptance. Foodie55 loves our Rootin’ Root Veggie Soup, a Fall Classic that is both flavorful and nutritious. 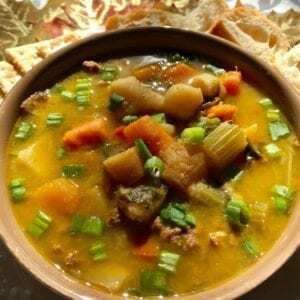 Our blend starts with browning a pound of grass-fed ground beef, onions, celery and carrots in a large pot then adding cubed squash and sweet potatoes (buy them cut from the grocery store, if you want), sliced parsnips and cubed yukon potatoes. Fill the pot with 6 cups of vegatable stock and 2 cups of water. Bring to a soft boil, then turn to low and let it simmer for 40 minutes to several hours. Especially yummy on a brisk Saturday – leftovers for the next week, too! 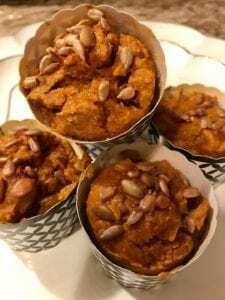 Pumpkin Date Pecan Muffins are easy to make and so incredibly yummy! Start with a box carrot cake mix, a 15oz. can of Pumpkin, stick of butter, 2 eggs, 3/4 cup of water, teaspoon of cinnamin and a dash of nutmeg & ginger. Fold in chopped dates and pecans. Spoon into baking cups. Bake on 350degrees for about 40 minutes or until the centers are done. They are soo moist – and we use them for breakfast, snacks and desserts! 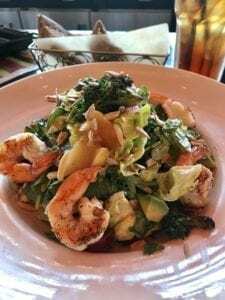 Super Food, Super Yummy Salad with mixed greens, avocado, broccoli, pears, grapes, almonds & shrimp. Easy to make, high in nutrition and soo delicious. 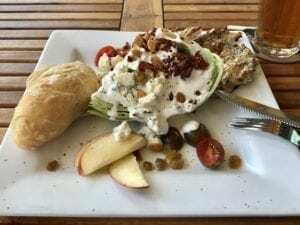 Foodie55 Friday suggests an old-fashioned Wedge Salad with some modern twists including white raisins, tomatoes, apple slices, blue cheese crumbles, chicken & ranch dressing or add your favorites. Seniors need extra protein, so add the chicken, shrimp, steak or your favorite to your salad. Roasted Chicken & Veggies Simply cut your favorite veggies in large chunks (we used onions, celery, carrots, broccoli, zucchini and red potatoes), place chicken tenderloins on top, season with rosemary, salt & pepper (or chose your favorite seasonings), drizzle with 3 tablespoons of Italian dressing over the top, cover and Bake 400 degrees for 35 minutes. 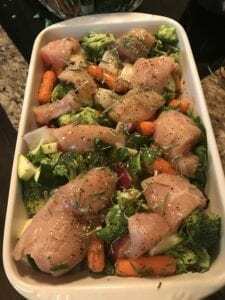 Super healthy, easy and yummy! 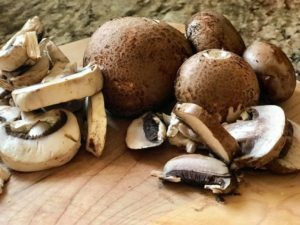 Foodie55 knows older adults are less efficient at synthesizing amino acids for muscle health (exercise helps, too) and they need to eat extra protein. This sammie is an extra turkey, cheese, slaw & lettuce creation. 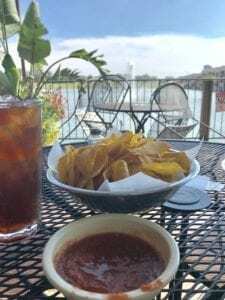 Foodie55 suggests grabbing a few friends, enjoying the sun while sittin’ by the lake and treating yourself to something yummy. Not quite ready for fall spice cake? 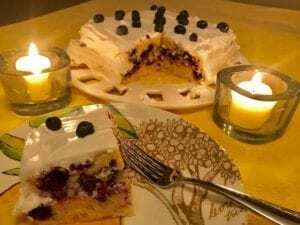 Foodie55 is sneaking in one more summer treat with with this homemade lemon cake with fresh blueberries~a favorite with a fresh fruit healthy twist. 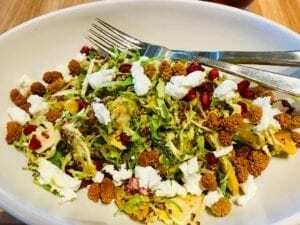 Foodie55 features this Super Food salad with high-nutrition, closes to nature, high antioxidant ingredients including mixed greens, avocado, tomato, corn, cilantro, beans, onion, radish and feta cheese. No dressing needed.